It’s a sad world when headlines like “Our Long National Nightmare is Over” can be identified as irony, even before you start reading the post underneath. Let me guess: did Mr. Cain write a scientific article for Foreign Policy? Nothing will be good, unless Sarah Palin joins the race. All eyes on the fishing town in Alaska! And good point about it; nobody has so much as barked about the fact that so few of our candidates are drawn to ink applied to the written word other than Gingrich who is a hack and Obama whose most productive days were just after Harvard Law Review editorship. 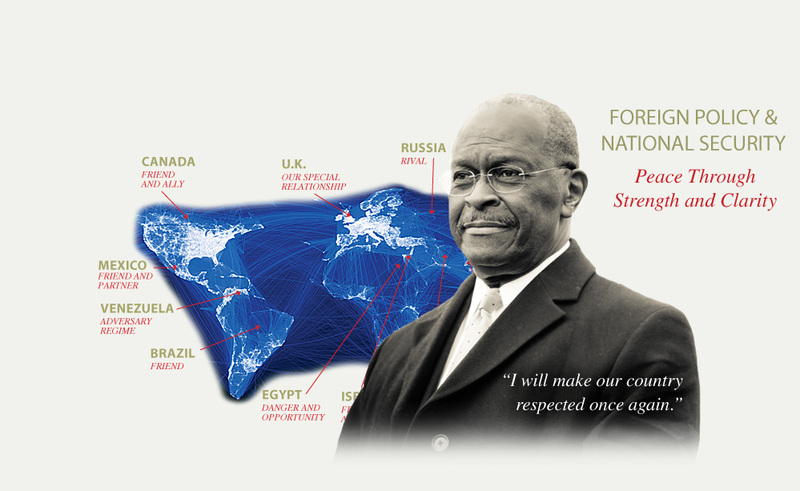 Just noticed that Herman Cain’s world _does not_ include any country east of, and I quote, “Uzbeki-beki-beki-beki-bekistan,” probably in an intentional and subtle shove at Jon Huntsman. “Ambassador to Singapore? Where is that?” East of Uzbekieki (repeat ad nauseum)…. Gee whiz, who knew Canada was our friend and ally. I’m just glad _Herman Cain_ knows. Is your title being ironic, Adam? Herman Cain is hardly Richard Nixon on the road to perdition. Those long nights when RMN got bourbon skunk rotten and conversed with the White House portraits. More likely a hack version of Montdale, and with even fewer working brain cells. Montdale now looks like a statesman compared to this clown, which is probably the best descriptor. In fact, the GOP potentials look more like a ship of fools sailing off to heaven knows where. And I am not dissing you in the knowledge that you paid out your hard-earned for that bumper sticker. Must be the Xmas effect. Best KT, and lets have some upbeat PRC-DPROK seasonal stories. I like the nixon comparison — yet even when wholly inebriated, the man still had a coherent — if sometimes scary — view of the globe. I’m not familiar with the details of healthcare as passed late in the first half of Obama’s current term, but I understand that at the time, most Americans wanted universal healthcare. Another achievement would be START – approved by the Senate late in 2010, after what apparently was a pretty long hassle. You mentioned Eisenhower’s remarks about the military-industrial complex some time earlier, Adam – it can be said that at least, the incumbent president is aware of the problem. This is also the first administration which seriously addresses the issue of re-industrialization, and American economic competitiveness. All that in a, let’s say, complicated political environment. Did I miss some terrible blunders from the administration, or could it be that no prophet will ever be accepted in his own land? I love that last sentence, JR! Indeed. I suppose this is part of the entire problem with hope. Got it, I think – your remark about Obama’s most productive days were about writing? Yes, precisely! Not in the legislative sense, but as a prose stylist.